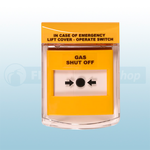 At the Fire Protection Shop we have a range of STI Call Point Stoppers that are UV stabilised polycarbonate covers that protect a range of electrical switches and call points without stopping legitimate operation. 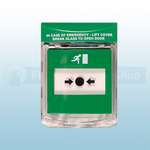 The call point stoppers are ideal for hotels, shopping centres, schools, colleges, hospitals, nursing homes and all public buildings where a risk of accidental activation is present. The call points are available in red, yellow or green and either flush mount or surface mount.